In 1984, the Wine Grape Productivity Tray was acquired from Sheffield Company. The tray, which measures 30 inches in length by 19-1/2 inches in width, is silver-plated and produced in the design of a classic champagne serving tray with a full border of bas-relief grape and vine patterns. The logo of the Vinifera Wine Growers Association, precursor to the Atlantic Seaboard Wine Association, now incorporated into the ASWA’s logo, is engraved in the center of the tray. 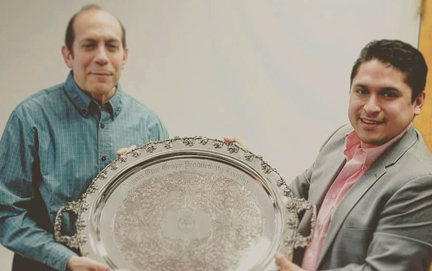 Since 1984, the tray has been presented to an individual or organization that has made major contributions to the sustainable growth and economic viability of the American wine industry, including professional consulting, innovation, technical research and knowledge, as well as leadership and active support. The tray has traveled and has been displayed across the United States, from Virginia to North Carolina and Alabama, up to Maryland, Pennsylvania and New York, and round-tripping to California. Each of the now 30 distinguished recipients have had their individual or organizational name hand-engraved on the back of the tray. Peter Bell is the recipient of ASWA’s 2018 Wine Grape Productivity Tray. The 2018 Wine Grape Productivity Tray is being presented to Peter Bell for his knowledge, innovation, research, leadership and support of the American wine industry. Peter’s generosity in helping to mentor other winemakers and consulting on problems to increase the quality of the whole Finger Lakes area is notable. 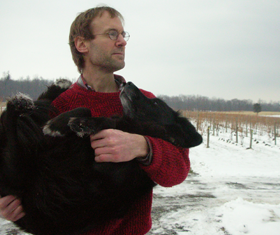 Peter Bell is the longtime winemaker at Fox Run Vineyards in the Finger Lakes Region of New York. He was born in Boston and raised in Amsterdam, Berkeley and Toronto. Peter studied enology in Australia and made wine in New Zealand before landing in the Finger Lakes. He was the winemaker at Dr. Konstantin Frank’s Vinifera Wine Cellars for five years before joining Fox Run in 1995. Fox Run Vineyards has over fifty acres of vineyards and is one of the region’s first artisanal wine producers. Peter is an adjunct professor in enology at Cornell University and a consultant to many wineries in the eastern United States and a mentor to many. Thomas Cosentino receives the ASWA Wine Grape Productivity Plate 2018 from Paul Tonacci. The 2017 Productivity Tray recipient is Thomas Cosentino, Executive Director of the Garden State Wine Growers Association (GSWGA), the statewide advocacy and promotional channel of the New Jersey wine industry. In that capacity, he oversees the day-to-day administrative and marketing functions of the organization and is the state’s liaison with New Jersey state government, including the Department of Agriculture, Tourism and Alcohol Beverage Control Commission. Among other initiatives, he helped to develop the grassroots campaign UncorkNJ, which led to the passing of the direct shipping bill in 2012 allowing in-state wineries to ship wine directly to consumers and for out-of-state wineries to do so as well. He has worked extensively with the business community involved with New Jersey’s wine industry and created a branding campaign to build awareness of New Jersey wines. This included television commercials, billboards, a radio show and online content, including the “At the Vineyard” TV show. The 2016 Productivity Tray recipient was Jim Law, owner and winemaker of Linden Vineyards. He is recognized internationally, nationally, and locally for his ongoing contributions to the crafting of excellent wines on the East Coast. Jim was an early pioneer in bringing top quality vinifera wine to Virginia, beginning in the early 1980’s. He has mentored and employed a large number of people who have gone on to become winery owners, viticulturalists, and winemakers at many of Virginia’s leading wineries. He and his crew at Linden are constantly experimenting with viticultural and winemaking techniques to bring out the best from the terroir at their vineyard site.